American Osetra the largest freshwater fish in North America and is the third largest species of sturgeon. This Osetra Sturgeon grows up to 20 feet long and can weigh up to 1,200 lbs. It’s native grounds are the West Coast of North America. Rated one the best Caviar’s by the New York Times. The Caviar eggs are medium to large. The Color runs from brown to black. The caviar is large in size and has an intense aroma with an unmistakable flavour. Caviar experts will particularly love its nutty flavor like Russian Osetra. Caught in the wild, Paddlefish are an ancient order of fish very similar to the Sturgeon. Globally, there are only two species of paddlefish, both living in the river systems of North America. The majority resides in The Mississippi & Tennessee Basin Regions. There pronounced snout has given rise to several descriptive names- alongside Paddlefish, they are commonly known as Spoonfish. Paddlefish produce the caviar considered similar to that of the Sturgeon species. This caviar has a delicious mild flavor and pleasant after taste. The eggs are a medium size with light to dark gray jewel like beads. 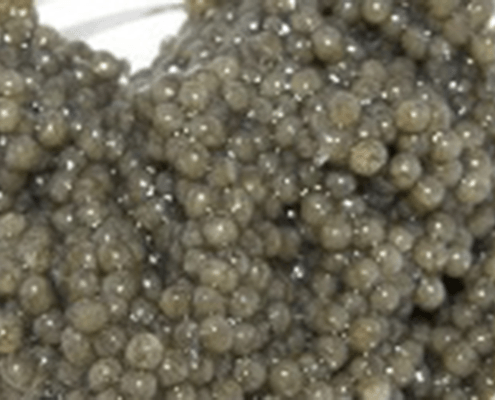 Many enthusiasts consider they resemble the roe of Sevruga Caviar. They have a true caviar essence, which is mild in flavour. This variety of caviar is very often marketed as American Caviar or Spoonbill Caviar. 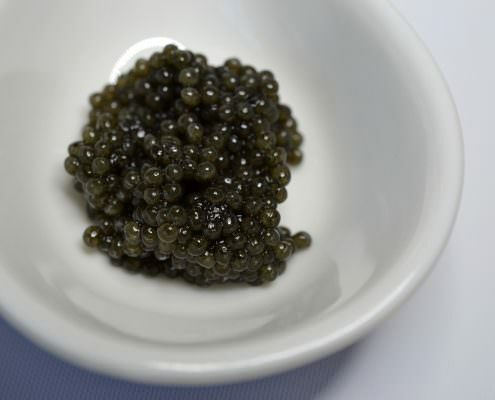 Paddlefish Caviar, like Sturgeon Caviar, is traditionally served on blini pancakes or point toasts. It is typically served with strong drink such as Vodka. The caviar is also used by chefs to create a dish or sauce. Caught in the wild in the fresh waters of Alaska, The Yukon, and British Columbia. Salmon & Salmon Roe is intertwined into the culture of these regions. The annual Harvest is associated with local festivals and celebrations. Salmon have a fascinating life-cycle. They start life in streams, migrate to the ocean to grow bigger and fatter, and return to the same stream to spawn (to reproduce). A very flavorful Bright Red Caviar. Egg size is the largest of caviar’s similar to Beluga. It is considered a delicacy in Russia and is a key Sushi ingredient. 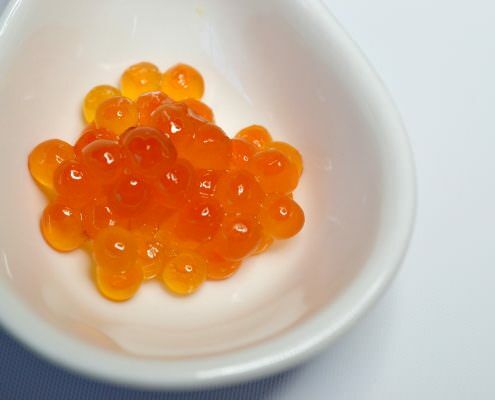 Salmon Roe is one of the most popular Caviar’s because the flavor is less strong with a delicious hint of Salmon and more familiar to the American pallet then other caviar’s. It also has a distinctive pop when consumed. This is typically the first caviar that someone who has never had caviar tries. Uses vary across the board from an ingredient used as a topping or stuffing (Particularly in seafood), as a garnish or part of a delicious sauce. It is also consumed by itself. In Russia it is typically served with Vodka as a compliment. Many other Western countries serve salmon roe with a White Wine preferably sparkling such as champagne. Commonly known as Hackleback or Shovelnose Sturgeon. This is the only Wild Sturgeon that can be legally caught in The USA and the smallest of the ancient sturgeon species in North America. The shovelnose sturgeon rarely exceeds 5 lbs in weight and grows to lengths of approximately 2 feet. They reach sexual maturity after 4-5 years. Hackleback Sturgeon is a fresh water fish that resides in the river systems of North America. The majority are found on the Upper and Lower Mississippi, Missouri, Ohio and Tennessee rivers. The eggs are slightly smaller then Sevruga or Paddlefish. The color is typically shiny jet black, similar to Beluga in color. The roe is preferred by many over Paddlefish due to it’s firmer egg and cleaner texture. The taste is characterized as clean, fresh, mild, subtle nutty flavor. Similar to Caspian Sea Osetra but smaller in size. 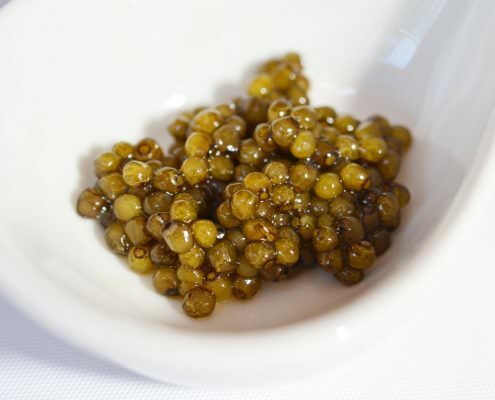 Sturgeon Caviar is traditionally served on blini pancakes or point toasts. It is typically served with strong drink such as Vodka. The caviar is also used by chefs to create a dish or sauce. A sturgeon hybrid of the Beluga (huso huso) originally from the Caspian Sea looks and tastes very similar to Wild Beluga. Our Farmed Beluga has medium-LARGE sized EGGS WITH A GOLDEN COLOR that produce a wonderfully delicate clean flavor and finish. Our Farmed Beluga caviar has a nutty flavor with buttery overtones. This caviar offers the distinct “Beluga Pop”. The Caviar is also ecologically sustainable since it is farmed. This is an important selling point since Wild Beluga is on the endangered species list and not allowed to be imported into The USA. This caviar is produced from the same species of Osetra fish found in the Caspian and Black Seas. This sturgeon grows up to six feet. Russian osetra cannot mature and reproduce quickly, making them highly vulnerable to fishing AND DIFFICULT TO FARM RAISE. gueldenstaedtii (Russian sturgeon) are farmed in pristine waters for 10 years before sexual maturity and Eggs are harvested. 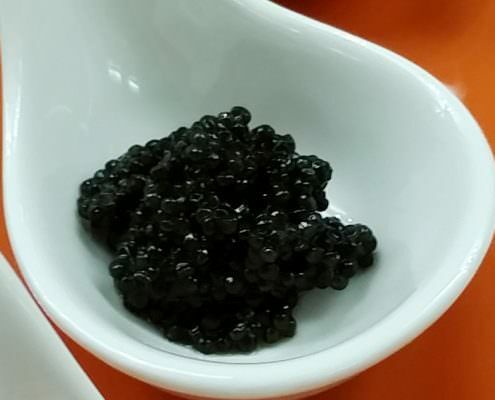 This Osetra is described as having a rich nutty sweet flavor and can be sold as “The Real Russian Osetra Caviar” that used to be imported from the Caspian Sea. Its color varies from a golden light to dark brown and has a medium-large sized egg that will please even the most sophisticated connoisseur. 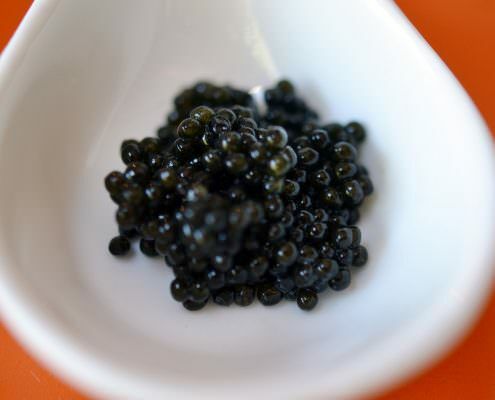 Russian Osetra is the highest quality Osetra you can buy. 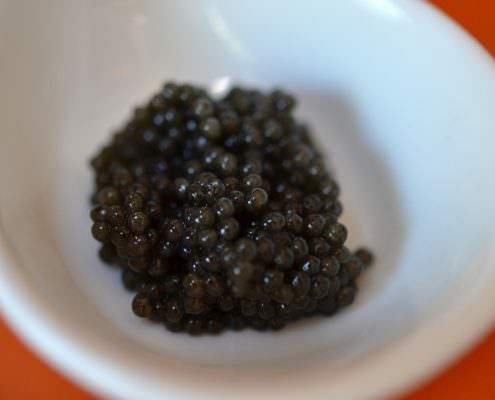 Sturgeon Caviar is traditionally served on blini pancakes or point toasts. It is typically served with strong drink such as Vodka. The caviar is also used by chefs to create a dish or sauce. Siberian Sturgeon original habitat in all of the major Siberian river basins of asia. As with all other sturgeons, the Siberian sturgeon lived up to sixty years, and reach sexual maturity after 8 years. Well known by great chefs as a delicacy for its meat, Siberian Sturgeon was one of the first Sturgeons to be successfully farm raised. The Caviar’s characteristics are similar to Sevruga with a dark medium sized firm grain running from grey to jet black in color. The flavor has been described as flavorful and sweet resembling an ocean breeze and taste of the sea.